Want a 5-Star AC Repair in Fort Myers? Advanced Air has the most 5-star ratings of any AC repair company in Fort Myers, Florida. We are prompt, reliable and most importantly, respectable. Our professional techs make it their priority to provide you with the best AC repair service and solution that best fits your Fort Myers home. We will have your AC unit back up and running within a day. And yes - we offer emergency service for any unexpected breakdowns. Want an accurate AC repair cost? Get a diagnostic! To determine the cost of your AC repair, we'll need to come to your Fort Myers home to find the problem first (diagnostic fee: $109). To schedule your AC repair contact us online or by phone (888)-853-5143 if you need an emergency service. We will work with your busy schedule to ensure its during a time that best fits you. Your HVAC technician will call you 30 minutes prior to arriving. You'll also get an email showing you the name and picture of the tech arriving. Once our HVAC technician arrives, they will investigate your AC unit, find the issue, and provide you with a price to repair your air conditioner BEFORE any work begins. No guessing. No surprises. No problem. We want our customers to be fully aware of their ac repair cost so they are not left worrying. Want to learn more about air conditioning repair cost factors? 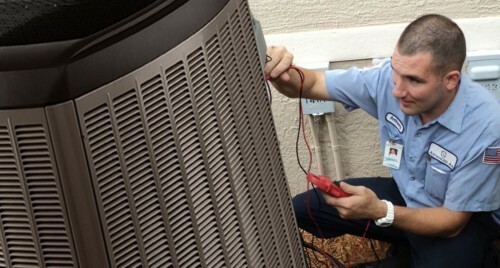 Read our blog article, What's the Cost to Repair an Air Conditioner in Florida"? That SAME-DAY, your HVAC technician will repair your AC - and all you have to do is sit back and relax. Once the job is complete you will receive an email survey so we can know if you are 100% satisfied with our air conditioning service. If not, we will make it right on our time and fully refund you for the repair. Check out our AC repair reviews, we insist! If you are not 100% satisfied with our repair within the 1st year, we will remove the parts we installed and refund 100% of your money. Want to save 20% on your AC repair? Ask about our CoolClub Agreement , which includes 20% discounts on repairs and much more.